We are pleased to announce that we are now going to be making a regular contribution to IFPRI’s annual flagship publication, the Global Food Policy Report, in the form of a statistical annex presenting up-to-date projections for key indicators of production, consumption, trade, and hunger from the IMPACT system of models. 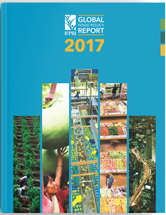 Click here for more information on the 2017 Global Food Policy Report. We are also making these annex tables available for download via our dedicated Dataverse portal. Annex Table 6 is available in extended format. Annex Table 7 is available in extended format.